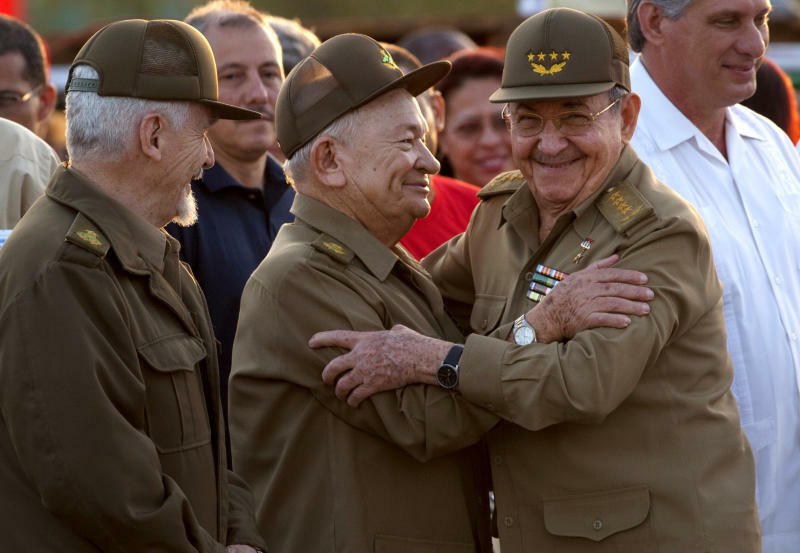 HAVANA (AP) — Cuban President Raul Castro said Thursday that his government is willing to mend fences with bitter Cold War foe the United States and sit down to discuss anything, as long as it is a conversation between equals. At the end of a Revolution Day ceremony marking the 59th anniversary of a failed uprising against a military barracks, Castro grabbed the microphone for apparently impromptu remarks. He echoed previous statements that no topic is off-limits, including U.S. concerns about democracy, freedom of the press and human rights on the island, as long as it is a conversation between equals. Washington would have to be prepared to hear Cuba's own complaints about the treatment of those issues in the United States and its European allies, he added. 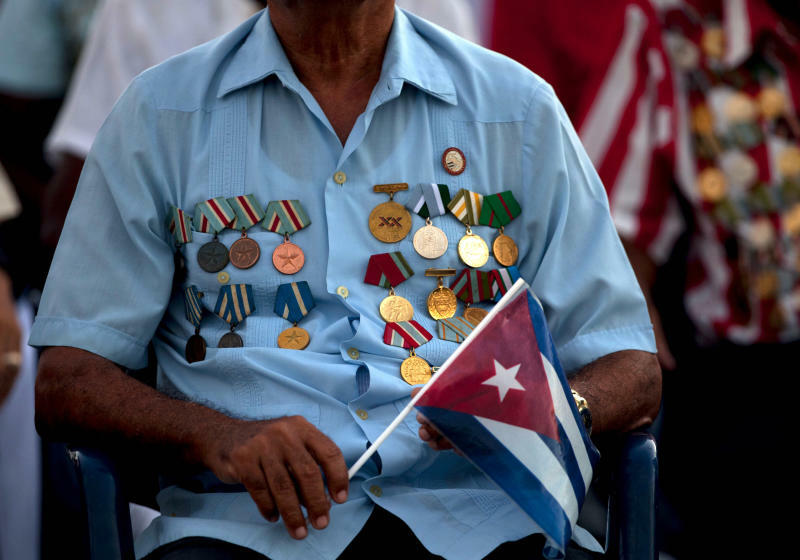 "We are nobody's colony, nobody's puppet," Castro said. Later Thursday, Mike Hammer, assistant secretary for public affairs at the U.S. State Department, said that before there can be meaningful engagement, Cuba must institute democratic reforms, improve human rights and release Alan Gross, a Maryland native serving 15 years for bringing satellite and other communications equipment into Cuba illegally while on a USAID-funded democracy-building program. "Our message is very clear to the Castro government: They need to begin to allow for the political freedom of expression that the Cuban people demand, and we are prepared to discuss with them how this can be furthered," Hammer said. "They are the ones ultimately responsible for taking those actions, and today we have not seen them." Hammer highlighted the brief detention this week of dozens of dissidents outside the funeral of prominent Oswaldo Paya, who died in a car crash last weekend, saying "the authoritarian tendencies are very evident on each and every day in Cuba." Days after Paya's death, Raul Castro had harsh words for the island's opposition, accusing them of plotting to topple the government. "Some small factions are doing nothing less than trying to lay the groundwork and hoping that one day what happened in Libya will happen here, what they're trying to make happen in Syria," Castro said. Castro also reminisced about the 1959 Revolution, promised that Cuba will complete a trans-island expressway halted years ago for lack of funds, empathized with islanders' complaints about meager salaries and said once again that his five-year plan to overhaul Cuba's socialist economy will not be done hastily. 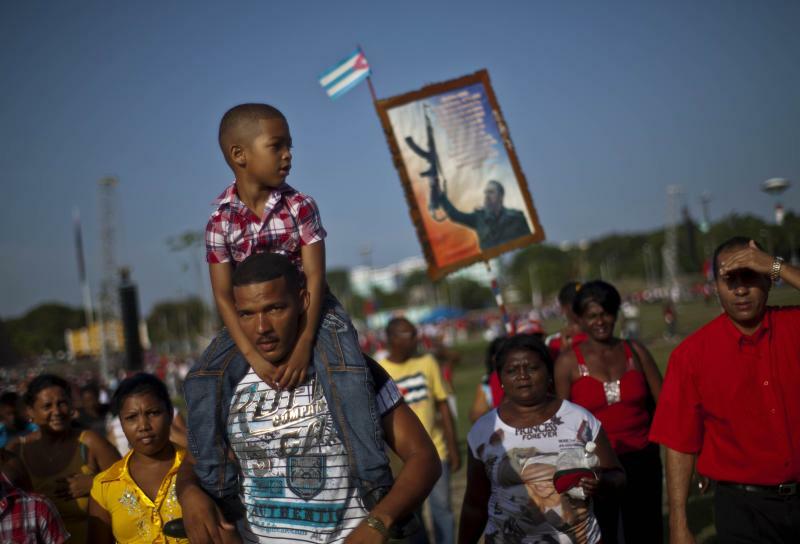 The July 26 national holiday was often used to make major announcements when Castro's older brother Fidel was president, but there were none on Thursday. The main celebration kicked off at sunrise with music and speeches at a plaza in the eastern province of Guantanamo, home to the U.S. naval base of the same name. The American presence in Guantanamo is a sore point for Havana, which demands the base be shut down and accuses the U.S. of torturing terror suspects held in the military prison. "We will continue to fight such a flagrant violation. ... Never, under any circumstance, will we stop trying to recover that piece of ground," first Vice President Jose Ramon Machado Ventura said in the keynote address. Musicians sang the song "Guantanamera," and a young girl read a speech paying homage to the revolution and resistance to "Yankee" imperialism. "We will be like 'Che,'" she said, repeating the mantra taught to schoolchildren across the island. Argentine-born guerrilla Ernesto "Che" Guevara is held up as a model of personal conduct in Cuba.